There are inevitably going to be a few players who are bothersome in chat, and a few who are abusive or violate the chat rules in other ways. 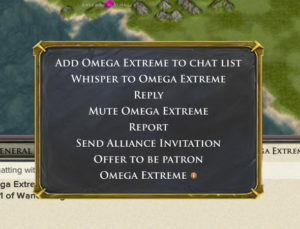 If you’d rather not receive any more chat messages from a particular player, you can mute them by clicking (or tapping) on a line of their chat and selecting “Mute [username]” from the menu. You then will not receive any more chat messages from any of that player’s accounts. If you’ve muted players and you would like to un-mute them, you can go to the Options panel and hit the “Unmute All” button. If you receive a chat message that violates any of the chat rules, you can report that message by clicking (or tapping) on the message and selecting “Report” from the menu. You’ll be asked to select a reason for reporting the message. After you’ve submitted a report, a moderator will review it and, if appropriate, may send a warning or impose a chat ban on the offending account. The identity of the player who submitted the report will be kept private.